We enter, now, the baseball and golf seasons with last week’s Detroit Tigers Opening Day and this week’s Masters Tournament – each event being a celebrated traditional rite of springtime, as is spring break travel. In Madrid, though, it is bullfighting season that is just underway; and an online search of the word “Madrid” will yield a flood of results not about the capital of Spain and the leafy boulevards, exciting local tapas and pinchos cuisine and astonishing art scene of Europe’s third largest city, but rather, about its century-old Real Madrid soccer team. “Real” translates to “Royal,” and the team, with a worldwide following, plays in the 81,000-seat Santiago Bernabeu Stadium and earns nearly $700-million annually, making it one of the world’s most valuable sports teams. Historic Plaza de Toros de Las Ventas, which, since 1931, has seated 23,798 Sunday spectators for bullfights between March and October – and daily during the San Isidro festivities from mid-May to early June – prices its tickets between $50 and $100 based on whether the assigned chairs surrounding the bull ring are shaded or situated in sunny Spain’s rays. 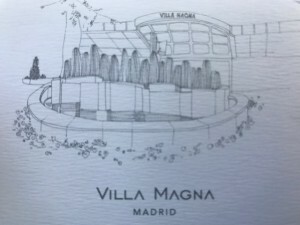 Madrid offers more than shade for comfort since its hotel offerings can seem as artistic as the works of Van Gogh, Titian, Goya, and others in the Prado and National Museums. A panoramic view from the Hyatt Centric Gran Via Hotel’s rooftop Via Fantastica restaurant shows guests, with handcrafted cocktail and authentic street food in hand, just how close they are to Madrid’s monuments and museums. Staying at the Gran Melia Palacio de los Duques is like waking up in a stately museum. The 1850-era former palace, teeming with large reproductions of masters works of art, is a five-minute walk from Madrid’s Royal Palace. 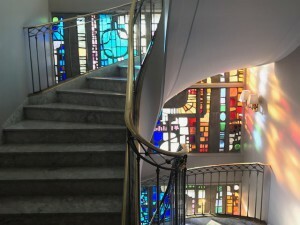 Local artisans contributed to the reconstruction of central Madrid’s Urso Hotel and Spa which provides an artistic sense of place through fanciful ironwork, vintage photographs of Madrid a century ago, and stained glass windows. Upon arrival, or at happy hour, a plate of traditional ham and cheese croquetas in Urso’s Media Racion restaurant further cements you are in Espania. The spa is super sleek, and the contemporary property’s location near Madrid’s “Golden Triangle” of art – the Prado, Reina Sofia, and Thyssen-Bornemisza museums) is prominent and convenient yet secluded. There is an artistry to bullfighting and soccer. 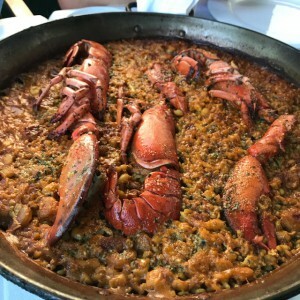 Hotel Villa Magna is 1.3 miles from the bullfighting ring and is located in an exclusive neighborhood near the U.S. Embassy and a street-side restaurant called “Bougainvillea” with perfect paella dishes – a Spanish specialty. You can walk off the flavorful, filling, rice-based dinner by strolling and shopping your way back to Villa Magna. 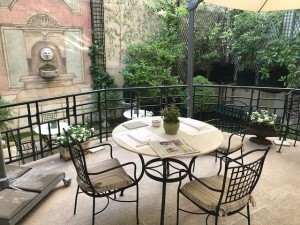 Hotel Orfila is a small and secret, neoclassical hideaway in the middle of a leafy lane with 19th-century décor and a secluded garden terrace – a perfect escape suitable for a sipping a glass of Cava in the center of the city. Each of its’ 32 rooms are different and regal – and the quiet hotel is 3.5 kilometers from Real Madrid’s booming soccer stadium.